I was in Whitehall, NY at the time, accompanying my daughter there to purchase her first car for $4000 with money she earned herself. Afterwards we stopped at the local convenient store to get some gas and buy a cup of coffee. As I perused the Lotto section, I recalled the Lotto Condition I did in the spring of 1984 as I was preparing to go to Korea for the first time. I rarely buy a lotto ticket, maybe once every 5 to 10 years, but in memory of that event I was inspired to buy a lotto ticket for $1 on pick 3 on the number 444. As I did so I was thinking about Father and considering that maybe he had just passed or was in the process of passing into the spirit world and leaving his physical body behind. It was a tangible consideration in my mind’s eye. 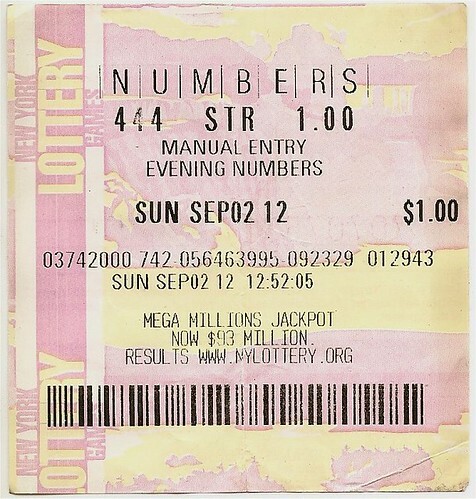 The time printed on that Lotto ticket is12:52:05 Sunday September 2, 2012, which in NY is actually known as Eastern Daylight Time because of the hour difference for daylight savings. This time corresponds in Korea to Monday September 3, 2012, at 1:52:05 in the morning. I later learned that the time of Father’s actual passing into the spirit world was within the next 2 minutes. Upon arriving in Korea a short time later (1984) and participating in the 7 million IFVOC signature campaign, I heard Rev. Ahn’s lecture covering the same topic. Amazingly he picked me out of 12 people who had given lectures at workshops before, to give the first lecture in front of 120 brothers and sisters from around the world. The topic Rev. Ahn gave me to cover was not the entire Principle of Creation, but only The Purpose of Life and The Spirit World and the Physical World. Miracles don’t fix what was broken at the Fall of Man, but restoration through indemnity via Jacob’s course does. Since we are in The Age After the Coming of Heaven, which Father reminded me of in a dream two or three months ago, one might wonder what aspect of the Divine Principle we can now apply that will move the world to more quickly embody God’s Ideal of Creation. The answer is clear, in a word, “Education.” Foundation of Faith and Foundation of Substance still constitute the Inner Four Position Base and the Outer Four Position Base that were required of Adam and Eve, even had they obeyed the Commandment. The dynamics of growth and development of the Individual Truth Body that is established through orderly stages of give and receive action still constitute the dynamics of the spiritual and physical worlds, and will remain the fundamental Divine Principle forever. Thank You HanulChamPuMoNim.